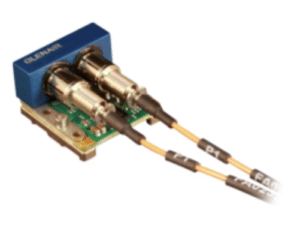 Glenair fibre optic jumpers connect from the transceiver to any Glenair Mil/Aero fibre optic connector style and a full range of evaluation boards are available, including an FPGA Mezzanine Card (FMC) version. Standard rating is for -40°C to +85°C operating temperature range, with extended temperature ranges available on request. ← Innovative OMNIMATE hybrid connectors from Weidmüller now at TTI, Inc.